never not dreaming: New in. Autumn ready. 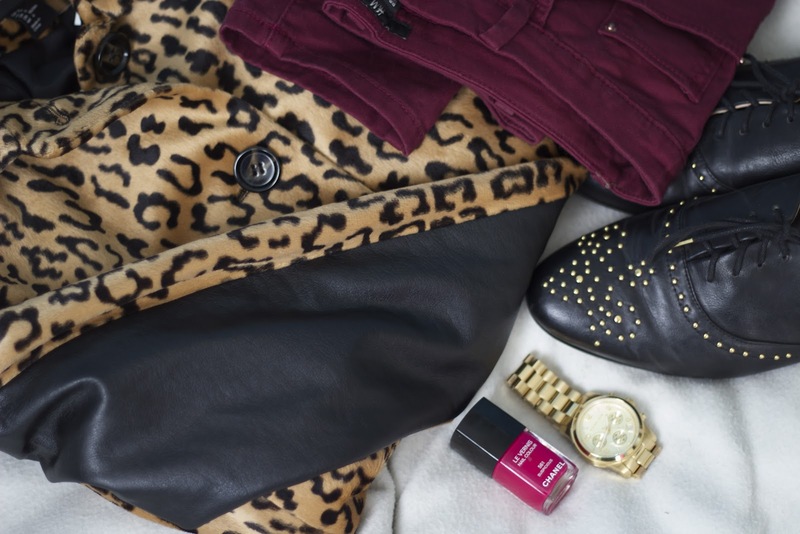 As promised, I have been looking for a leopard print coat and here it is! Right on front of my eyes in H&M! This brand never tends to disappoint me as far as essentials are concerned... And I love the black leather strips on the insides of the sleeves. Great! And a bargain! I also picked up black studded bluchers from Zara TRF for the autumn walks in the park. Who doesn't enjoy it when the trees go all yellow and red? As I said before, red was never my favourite colour, but the ox blood - we are beginning our little dirty affair this season! First item- ox blood jeans from H&M (a bargain again!). To top things off I got a classic men-like watch and nail varnish just perfect for autumn. I'm saying goodbye to my pink and orange varnishes and swapping them for reds and greys. I'm also looking for a juicy emerald green one. What are you key pieces for this autumn?